Looking to set your pool table apart from the others? 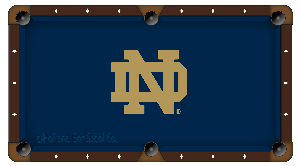 Look no further than our NCAA Billiard Cloths manufactured by Hainsworth of England, with over 225 years of experience! Click and find your school! Make sure everyone knows who your favorite NFL team is by proudly displaying its logo on your pool table. The fabric is 100% polyester so it's easy to clean, with an anti-friction coating for lively games and reduced ball marks. Available in 8' and 9'. Want to show just how much of a hockey fan you really are? 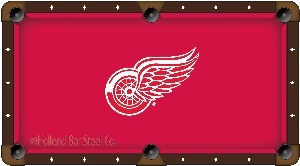 No better way than our NHL Billiard Cloths manufactured by Hainsworth of England, with over 225 years of experience! Click and find your team!